Power Integrations (Nasdaq: POWI), the leader in high-voltage integrated circuits for energy-efficient power conversion, today announced that a range of adapter designs based on Power Integrations’ InnoSwitch™3-Pro and InnoSwitch3-CP ICs have achieved compliance with USB Power Delivery (PD) 3.0 standards. During a recent workshop in Portland, Oregon, nine adapter designs featuring InnoSwitch3 devices – including several designs submitted by leading power-supply manufacturers – successfully completed USB PD 3.0 compliance testing. 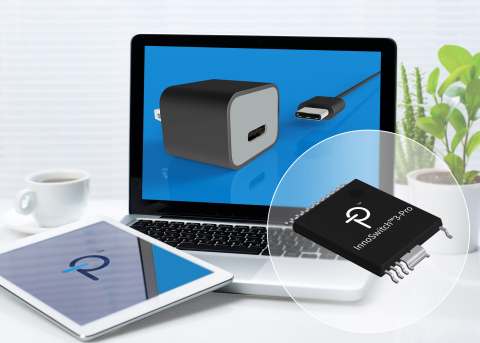 Several of the successful designs incorporated the advanced PPS (Programmable Power Supply) option within the USB PD 3.0 standard, which enables faster charging of smartphones, tablets and notebooks without generating dangerously high levels of heat in the device itself. The dynamically configurable InnoSwitch3-Pro integrated switcher IC family from Power Integrations enables digital micro-stepping of voltage and current for precise battery charge control. Capable of delivering up to 65 W and achieving up to 94% efficiency across line and load conditions, the new devices may be paired with a microcontroller or take inputs from a system CPU to control and monitor the off-line power supply. InnoSwitch3-Pro supports virtually any rapid-charging protocol, including USB PD 3.0 + PPS, Quick Charge™ 4/4+, AFC, VOOC, SCP, FCP and other industrial and consumer battery charger standards, as well as applications in dimmable LED ballast drivers and field-configurable industrial power supplies. InnoSwitch3-Pro samples are available now, priced at $1.12, in 10,000-piece quantities. Technical support for InnoSwitch3-Pro ICs is available from the Power Integrations website at: www.power.com/products/innoswitch/innoswitch3-pro. Power Integrations, InnoSwitch, FluxLink, and the Power Integrations logo are trademarks or registered trademarks of Power Integrations, Inc. All other trademarks are the property of their respective owner.